Have you heard about the cosmetic dentistry solution known as porcelain veneers? They are a lot like they sound – thin shells of porcelain that are laid against the teeth, providing a nearly immediate improvement in the appearance (and function) of the smile. 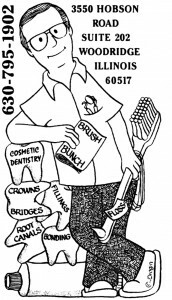 Thomas J. Machnowski DDS in Woodbridge, IL offers porcelain veneers to patients addressing a range of dental issues. Only your cosmetic dentist can help you determine if porcelain veneers are a workable answer to your needs, but you should know that they do provide a wide range of solutions. When you are a candidate for porcelain veneers, you will visit our office to have your teeth prepared for receiving them. This involves the removal of some of the enamel, but not enough to compromise the tooth. In fact, for some patients, the use of dental veneers may actually fortify or strengthen a damaged tooth. During your initial visit, molds are made of the mouth, and a dental lab uses them to create the ideal veneers to meet your needs. Temporary veneers are placed at this first visit, and we take time to ensure that the color of the permanent veneers are a good match to the rest of the natural teeth. Once the lab returns the veneers, you come in for a short office visit where they are placed and bonded to the pre-prepared teeth. You can then leave with an entirely new and improved smile. No one will be able to detect that you have the porcelain veneers in place, and you can use those teeth just as before without any worries about the veneers remaining in place. Veneers are a remarkable solution to a host of issues. They can last for many years, though you will need to provide standard dental care, just like a real tooth! If you have additional questions about porcelain veneers, or about any of the other treatments mentioned here, give us a call at our Woodridge, IL office at 630-795-1902. You can also use our online contact form and one of our staff will get back to you promptly.